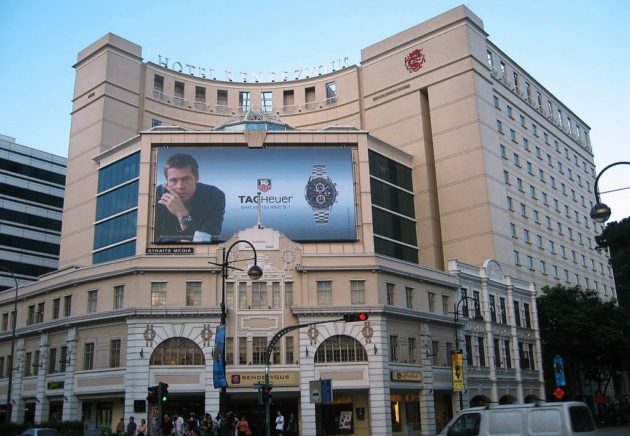 There’s no doubt your wrist, not to mention your wallet will be wowed by the “WOW SALE” taking place at WorldofWatches.com this week. 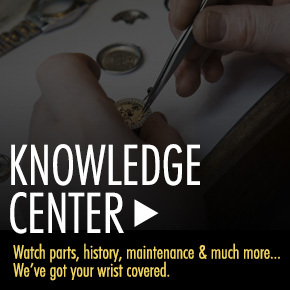 Many of today’s most sought-after watches from today’s top watchmakers are presented in this ground breaking promotion. Over 70 high-end luxury styles for men and women are featured, including models from Rolex, Omega, Oris, Breitling, Cartier, Tissot, Chopard, Corum, Movado, Bulova Accu-Swiss, TAG Heuer, Rado, IWC, Maurice Lacroix, Chanel and Eterna. 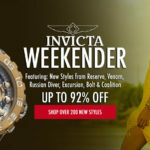 Whether you are looking for a high-performance automatic timepiece or a high-fashion wristwatch, you will find many great choices to select from during the promotion at savings up to 83% or more. In addition, many of the WOW Sale choices come with stress-free payments, giving you the option of paying for your new watch over time for a duration of several months after you purchase and receive it. The Rolex Oyster Perpetual Datejust Automatic men’s watch is certain to put your wrist on the fast-track. The classic contemporary lines are right for every occasion… from Monday morning boardroom meetings to Sunday afternoon tennis matches. It has also been awarded official Chronometer certification by the prestigious COSC (Official Swiss Chronometer Test Institute). Masculine and urbane, this outstanding wristwatch features the signature round Oyster case in premium grade stainless steel with a contrasting brushed and polished finish. The handsome Jubilee bracelet in satin finished, brushed steel features polished 18K yellow gold center links and a fold-over locking clasp for added security. The signature 18K yellow gold bezel has decorative fluted detail. The matching fluted crown in 18K gold adds to the stylish design. The highly legible yellow gold colored dial with a fluted background shines with luminous baton hands and baton hour markers. A magnified window at the 3 o’clock hour reveals the automatic date calendar. 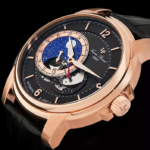 Features include a scratch resistant crystal above the dial, water-resistance to 100 meters or 330 feet and self-winding Swiss-made automatic movement inside. 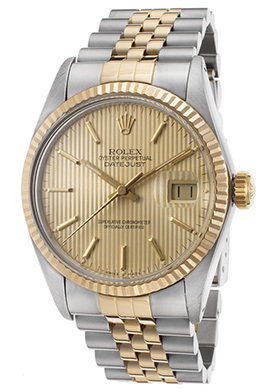 Rolex Oyster Perpetual Datejust Automatic men’s watch is 36mm in diameter and 13mm thick. The Chopard Happy Sport Diamond Watch is a vibrant and alluring choice for women. Elegant and understated, this classic women’s dress watch features the rectangular shaped case in premium grade stainless steel, highly polished to a mirror-bright patina. The black crocodile-textured leather strap adds to the striking design. Five high-quality diamonds bezel set to perfection float between two sapphire crystals above the white dial with polished silver-tone sword hands Roman numeral and slanted baton hour markers. Features include a cabochon-cut gemstone accent above the crown and water-resistance to 30 meters or 100 feet. Premium Swiss-made quartz movement inside provides precise time-keeping accuracy. 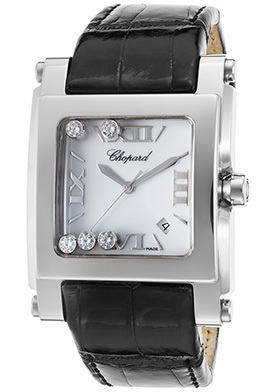 Chopard Happy Sport Diamond women’s watch is 36mm wide and 11mm thick. The TAG Heuer Aquaracer Calibre 5 Automatic men’s timepiece is another watch that wows. Rugged and thoroughly masculine, this outstanding men’s diving watch features the robust black ion-plated stainless steel case in a satiny brushed finish, presented on a highly attractive and hard-wearing black nylon strap with yellow stitched detail and a yellow nylon inside panel. Strap has a deployment clasp closure for added convenience and security. The unidirectional rotating black ceramic bezel with engraved markers surrounds the black dial with luminous hands and hour markers. A magnified window at the 3 o’clock hour reveals the automatic date calendar. 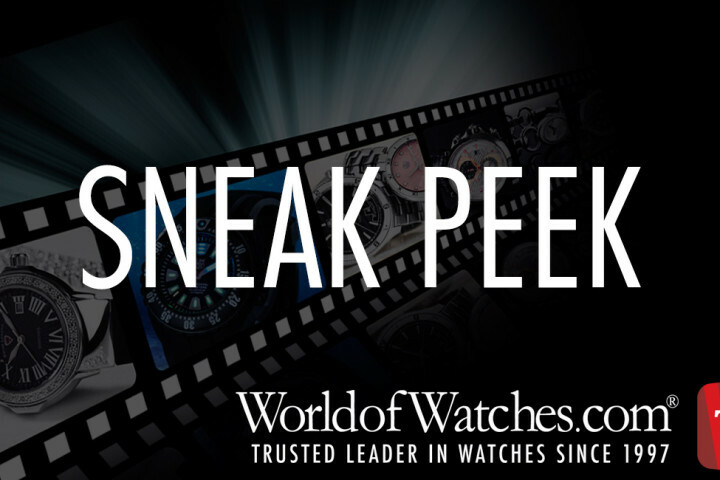 The self-winding Swiss-made automatic movement inside has a 38-hour power reserve. Features include a scratch resistant sapphire crystal above the dial, along with a screw-down crown and case back for water-resistance to 300 meters or 1,000 feet. 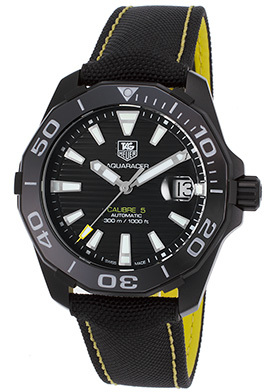 TAG Heuer Aquaracer Calibre 5 Automatic men’s watch is 41mm in diameter and 11mm thick. 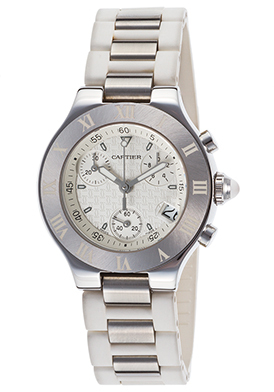 The Cartier 21 Chronograph is a sleek and sporty selection for today’s woman. This updated, modern take on the classic 21 Watch features the slim, slender round contoured case in premium grade stainless steel with a satiny brushed finish. The updated white rubber strap with interlocking stainless steel accents has a convenient deployment clasp closure. 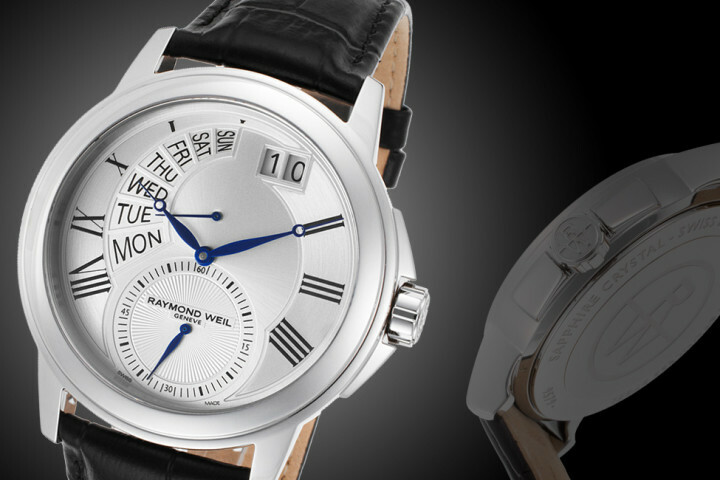 A cabochon-cut white rubber accent tops the ornamental polished stainless steel crown. The signature, stationary brushed steel bezel with engraved Roman numeral hour markers encircles the patterned white dial with the signature Cartier emblem patterned back ground , three sub-dials, luminous white sword hands and hour markers. Chronograph has an automatic date calendar, 1/10th of a second, small-second and 30-minute time counters. Features include premium Swiss-made quartz movement inside and a scratch resistant sapphire crystal above the dial. A locking screw-down crown and case back provide water-resistance to 100 meters or 330 feet. Cartier 21 Chronograph women’s chronograph is 32mm in diameter and 9mm thick. TAG Heuer billboard outside of the Rendezvous Hotel in Singapore image courtesy of Wiki Commons. Watch Out: WOW TV Sneak Preview For January 23rd & 24th! Command Attention With Swiss Legend Commander Series: Savings of Up to 90% off Now.